The drive up to the Mt Cabot Trailhead was a long one as it was much further north than the bulk of the White Mountain ranges. Continuing north from Franconia Notch, I passed through Whitefield, Lancaster, and Groverton before reaching the tiny village of Stark, only a few miles east of the Connecticut River and the Vermont border. 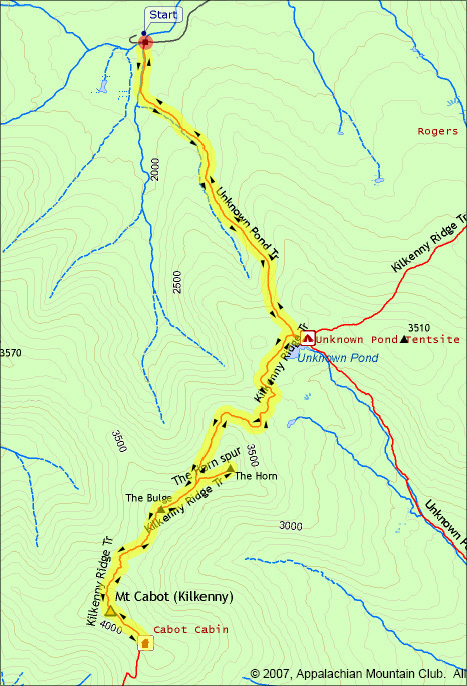 The Unknown Pond Trail begins about 4 miles south of town down the long winding gravel Mill Brook Road. 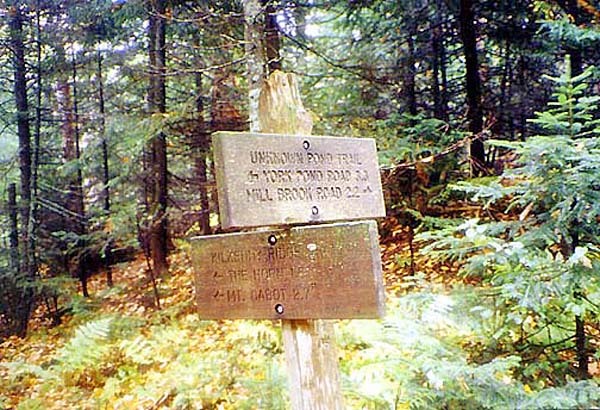 The White Mountain Guide had indicated that Mill Brook Road would be gated almost a mile from the actual trailhead. But luck was with me; the gate was open, so I drove on through, parking almost directly across from the trailhead. Muffin and I crossed the road and started up the leaf-strewn trail. The strong scent of decaying leaves and plant matter filled the air. The going was easy but not as effortless as it should have been because I hadn't been getting much exercise and was a bit out of shape. About 3/4 of the way up to the pond, someone had put a makeshift sign on a tree warning about bees on the trail ahead. I walked ahead cautiously, expecting to see them swarm around me any second. But we soon passed the marked area where another sign greeted hikers coming down the trail. Apparently, the bees had left the area. Before long, the trail leveled off and we came to the Kilkenny Ridge Trail, with Unknown Pond just a few steps off the trail. The woods were cool and open, and the views across the pond were excellent. It was a nice restful spot and would have been especially welcome on a hot day. 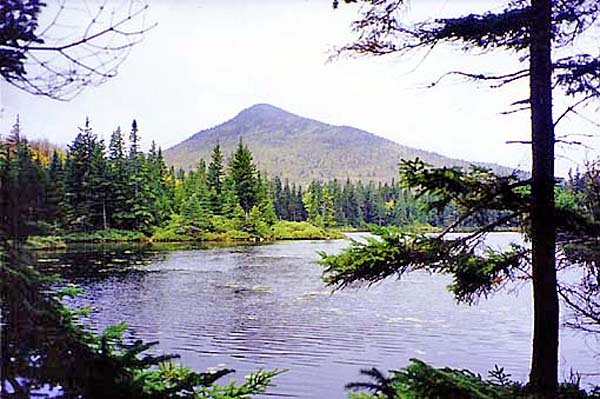 The Horn, a small and picturesque peak along Kilkenny Ridge juts up out of the woods across the pond to the south. It was our next destination as it was only a short detour off the trail to Mt Cabot. 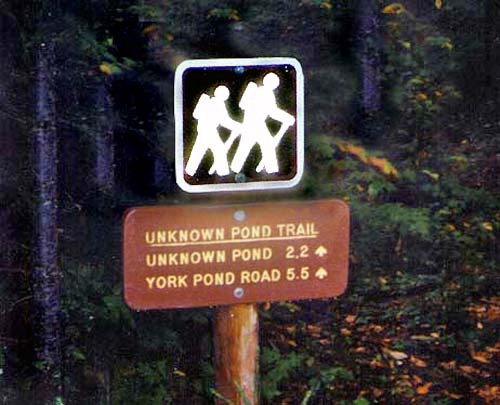 Unknown Pond Trailhead. This trail begins about 4 miles south of the village of Stark down the long winding gravel Mill Brook Road. 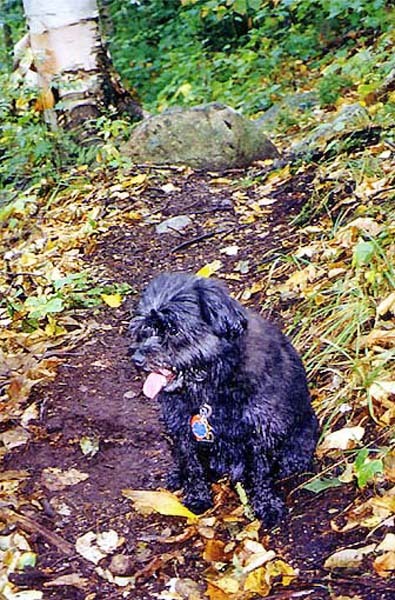 Muffin on the Unknown Pond Trail. The lower part of this trail was leaf-covered and smelled strongly of decaying leaves and plant matter. Unknown Pond and Kilkenny Ridge Trail junction. The pond is only a short distance from this spot. Unknown Pond and the Horn. The woods around the north end of the pond where I took this picture were cool and shady.